After a nice long weekend of self-medication in the Big Easy for a little shindig called “Mardi Gras,” I came home, logged on to finish a blog post and SURPRISE!!! DIYstinctly Made was nominated for an award by fellow blogger Sharaya D’anna of She Loves Happy. 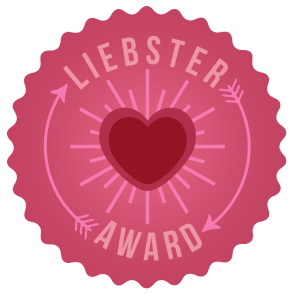 A Liebster Blog Award to be exact. What the hell is that, you ask? The Liebster Award originated in Germany and is a chain mail award of appreciation. In the words of Sharaya, “This is not actually an award but just a way to connect with other bloggers around the world who are starting out to give them a little boost and share the love.” Well thank you for the love, Sharaya! I’m super excited that someone enjoys what I post! 1. Describe your dream vacation. My dream vacation would definitely be a trip with my husband to the secluded island of St. John in the U.S. Virgin Islands. I’ve done a good bit of traveling in my day, but I’ve never experienced snorkeling like I have in St. John. When I went on a cruise to Atlantis and saw the giddy reaction my husband had to the less than impressive grass growing in the ocean, I knew I had to bring him to the Virgin Islands. Lucky for us, we’ll be going THIS July! 2. What is one goal you hope to accomplish with your blog? I hope to inspire my readers to tackle DIY projects of their own and give them tips along the way. In this recession, I can’t afford the things I want…so I make them. I know there are several people out there who are in the same boat and I want to show them what they are capable of. Christmas. Not for the presents (anymore), but for the family gatherings. There is nothing I love more than my family and spending time with them. We live 2-3 hours away from Kurt’s family, and 2-10 hours away from mine. Needless to say, I cherish the time I get to spend with them. 4. What is one food you will not eat? 5. If you could speak any language, what would it be and why? HA! This one made me laugh. It depends on who you ask, really. After a few drinks, hell yeah… I’m an amazing dancer. Judging by the multiple stares I get while dancing, no, I’m not good at all. I will be the queen of child embarrassment. 7. Do you prefer bubbles baths or showers? I prefer baths, I take one almost every night and morning. It’s so relaxing to be hugged by warm water but I have to say I’m not much of a fan of the bubbles. Mainly because they gunk up the jets. 8. If you could ask your future self one question, what would it be? NOW do you appreciate your 20’s body?! 9. What other countries have you been to? I love to travel across the pond. I am proud to say I’ve been to Sweden, England, Italy, Spain, France, Mexico, Bahama, Dominican Republic, U.S. and British Virgin Islands. 10. What’s the weirdest thing you’ve ever eaten? I guess to a lot of people it would be crawfish… but crawfish boils are one of the best Louisiana’s pastime, ever. I’m still choosing the perfect blogs to nominate so think of this section as a work in progress! This dynamic duo is fixing up their charming Spanish Town home and preparing to bring home baby. Check out their renovated nursery! They also post about other projects around the house, I love it! This freak of nature got married, had a baby, and bounced back to pre-baby weight in no time. She posts workouts you can do with your baby and insanely adorable baby fashion. This family is totes gorg. 2. wHAT DO YOU hOPE TO ACCOMPLISH WITH YOUR BLOG? 4. name your all-time favorite song. 6. What is the best meal you’ve ever prepared? 7. if you could choose your last words, what would you say and who would you say them to? 9. If you won the lottery and could only spend it on selfish wants, what would you buy first? 10. What was your favorite vacation? Love it! Thanks for the nomination, can’t wait to keep it going!